CANTON, MA, ORRVILLE, OH, and WATERBURY, VT (May 27, 2015) -- Dunkin' Brands Group, Inc., (NASDAQ: DNKN), The J.M. Smucker Company (NYSE: SJM) and Keurig Green Mountain, Inc. (Keurig) (NASDAQ: GMCR) today announced that Dunkin’ K-Cup®* pods are now available for sale at thousands of retailers nationwide for the first time. 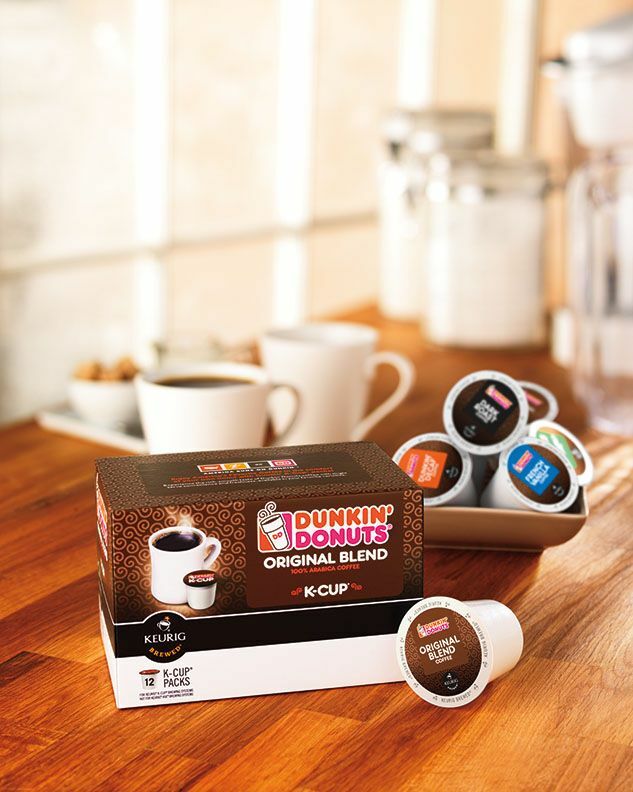 As part of an agreement between the three companies first announced in February, Smucker will distribute and market Dunkin' K-Cup® pods exclusively to grocery chains, mass merchandisers, club stores, drug stores, dollar stores and home improvement stores. Keurig will distribute and market Dunkin’ K-Cup® pods exclusively to specialty stores such as Bed Bath & Beyond, Kohl’s and Macy’s, as well as office supply retailers such as Staples and Office Depot beginning this summer. Dunkin' K-Cup® pods are also now available for sale online at OnlineStore.Smucker.com and Keurig.com, as well as DunkinDonuts.com. The Dunkin’ K-Cup® varieties available online and in grocery, mass merchandise, club, drug and other retailers nationwide include Original Blend, Decaf, Hazelnut, French Vanilla and Chocolate Glazed Donut. A coupon for $1.50 off the purchase of any two packages of Dunkin’ K-Cup® pods or packaged coffee at grocery stores and other retailers nationwide will be available in select Sunday newspapers on June 14, 2015. In February, Dunkin’ Brands, The J.M. Smucker Company and Keurig signed agreements for the manufacturing, marketing, distribution and sale of Dunkin' K-Cup® pods at retailers nationwide in the U.S. and Canada, and online. Keurig remains the exclusive producer of Dunkin' K-Cup® pods. The J.M. Smucker Company currently manufactures and distributes Dunkin' Donuts® brand premium bagged coffee where groceries are sold, under license from Dunkin' Donuts. With more than 18,800 points of distribution in nearly 60 countries worldwide, Dunkin' Brands Group, Inc. (Nasdaq: DNKN) is one of the world's leading franchisors of quick service restaurants (QSR) serving hot and cold coffee and baked goods, as well as hard-serve ice cream. At the end of fiscal 2014,Dunkin' Brands' nearly 100 percent franchised business model included more than 11,300 Dunkin' Donuts restaurants and more than 7,500 Baskin-Robbins restaurants. Dunkin' Brands Group, Inc. is headquartered in Canton, Mass. For more than 115 years, The J.M. Smucker Company has been committed to offering consumers quality products that bring families together to share memorable meals and moments. Today, Smucker is a leading marketer and manufacturer of consumer food and beverage products and pet food and pet snacks in North America with annual net sales of approximately $8 billion. The Company remains rooted in the Basic Beliefs of Quality, People, Ethics, Growth, and Independence established by its founder and namesake more than a century ago. For more information about the Company, visit jmsmucker.com.